ICRC, College of Europe. In: Collegium, No. 45, Fall 2016, 189 p.
The 2015 edition of the Bruges Colloquium on international humanitarian law dealt with urban warfare. The recently published Proceedings of the Colloquium are therefore an ideal complement the newest edition of the International Review of the Red Cross which focuses on War in cities. It constitutes a must read for those who would like to have a better understanding of what is at stake with the growing urbanization of warfare. Armed groups under international humanitarian law, human rights law and international criminal law : What degree of organisation is required? Tilman Rodenhäuser. – Geneva : IHEID, 2016. – 361 p.
Tilman Rodenhäuser’s prized PhD thesis examines the degree of organization required from non-state armed groups to become relevant actors under three distinct fields of international law (including IHL). There is no doubt that Dr Rodenhäuser’s thesis, which he successfully defended not too long ago, will shed some very much needed light on the critical question of when armed groups have obligations under IHL and under international law more generally. A revised version of the thesis will be published in the coming year. Amanda Alexander. In: Melbourne Journal of international law, Vol. 17, June 2016, p. 1-36. Drawing on the negotiating history of the two 1977 Protocols additional to the Geneva Conventions, this article aims at illustrating how the anti-colonial discourse of the 1970s – exacerbated by the Algerian War and the strong opposition to the Vietnam War – shaped the discussions which ultimately led to the adoption of these two legal instruments. Alexander’s analysis couldn’t be more timely, as the year 2017 marks the 40th Anniversary of the Additional Protocols (and, by the same token, the 30th Anniversary of the publication of the English version of the Commentary thereto). 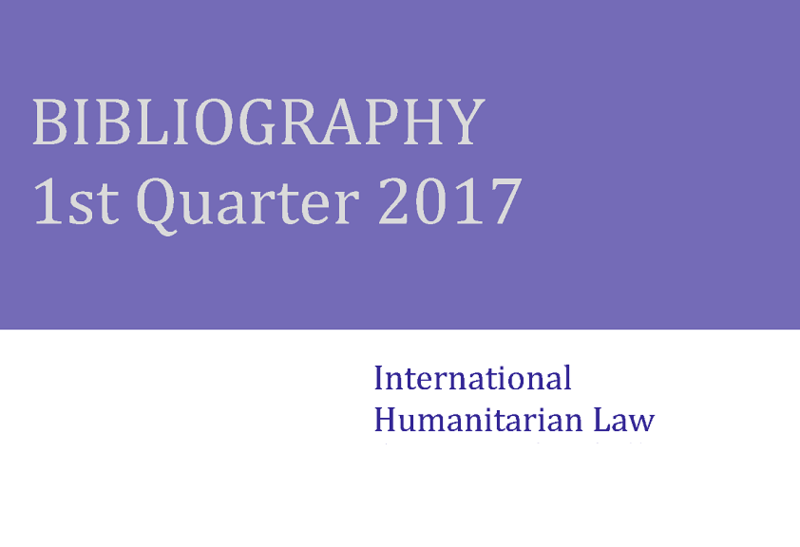 A “special edition” of the IHL Bibliography presenting articles, chapters and books focusing on the adoption of the 1977 Additional Protocols is in preparation and will be published in June. Anyone even remotely interested in international public law is probably already aware of the existence of the Max Plank Encyclopedia of Public International Law (MPEPIL). After all, this ginormous (over 1600 entries) collective work (over 800 authors) whose origins date as far back as 1924 has helped generations of jurists to better understand the multifaceted corpus of public international law. 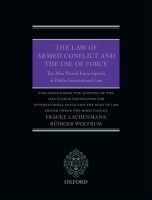 As part of a new thematic series, the Max Plank Foundation for International Peace and the Rule of Law has released a volume entirely dedicated to the law of armed conflict (LOAC) and the use of force. The ICRC library has recently acquired two copies of the book, one of which can be borrowed and the other one being available for consultation only. Most entries related to the LOAC and the use of force can also be consulted on the electronic version of the MPEPIL (which is also accessible from the ICRC Library).